App Engine application that streamlines document workflow and reduces number of invoices piling up on managers' desks. The application receives emails with attached PDF documents from multifunctional scanners, detaches files and uploads them to Google Docs. After applying access rights according to predefined set of rules it then notifies managers. 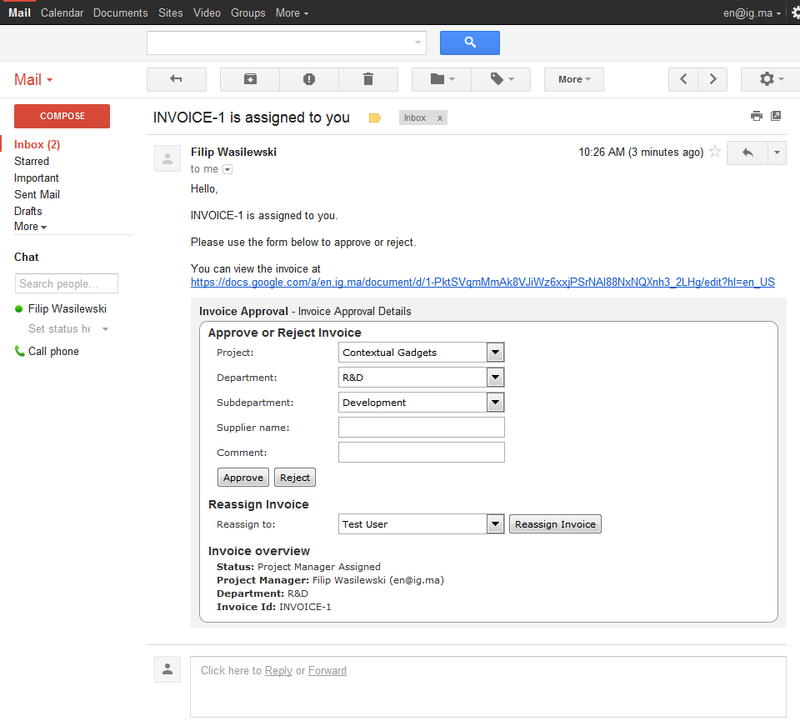 Notified people receive call-to-action emails that trigger Google Mail Contextual Gadget visible under the message text. The gadget displays invoice information, current status and action form along with document preview. Managers can then take action and approve or reject the document straight from the inbox without ever leaving Google Mail. Collected document statuses are recorded and are used to generate spreadsheet with information for accounting. Invoice information and action form right inside Google Inbox.